Holt school board Treasurer Ben Bakken speaks during the meeting Oct. 1 at the Holt Administration Building. Bakken expressed concern in the meeting over how post-employment benefits liabilities were to be paid. 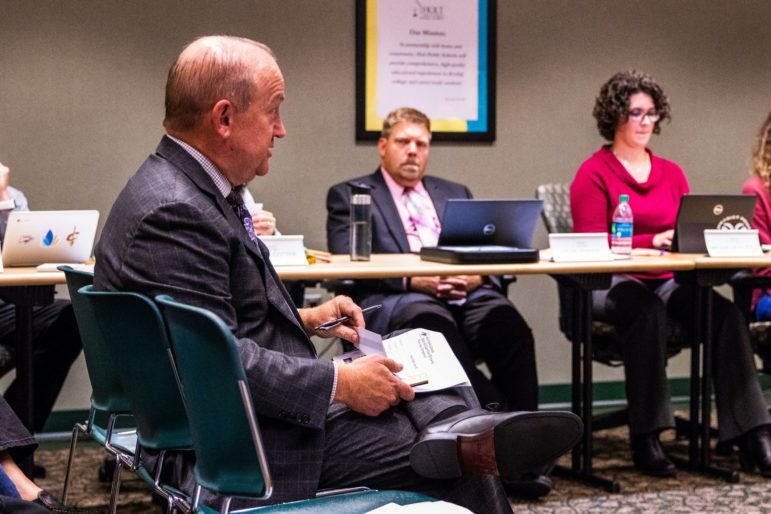 A regular financial audit of Holt Public Schools drew both praises from the public as well as questions and concerns from board members. 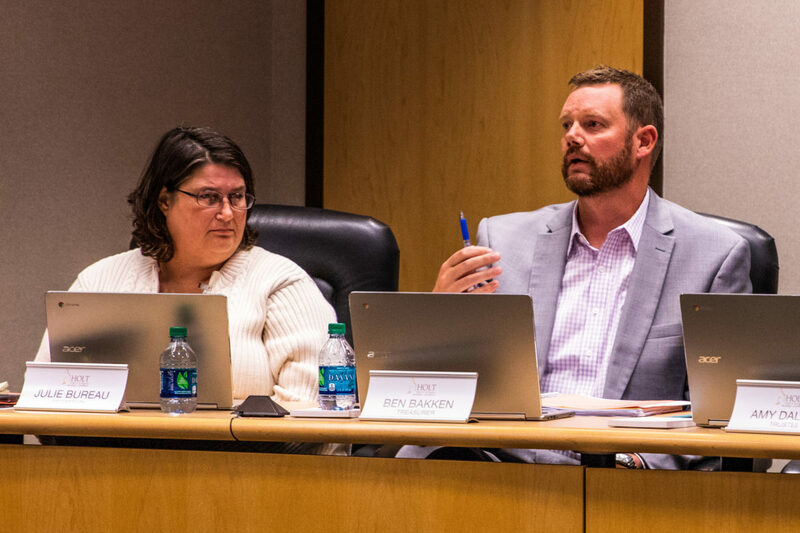 Plante Moran certified public accountants Michael Foster and Tiffany Stacey presented their financial audit to the school board at its Oct. 1 meeting. One detail in Stacey’s presentation was the number that Holt schools pays in both pension payments and other post-employment benefits, also known as OPEB. The audit included a pension liability of $92.8 million and an OPEB liability of $31.7 million. Board Treasurer Ben Bakken raised concerns after Stacey spoke over how the pension and OPEB liabilities were planned to be paid out. Foster said there is not a short-term fix to the retirement cost liability. “(The deficit) isn’t going to go away without significant funding from the districts,” Foster said. She said many school districts show similar pension and retirement-related liabilities. Plante Moran CPA Michael Foster speaks about Holt Public Schools’ financial audit at its Oct. 1 school board meeting. The audit’s financial statement was given an “unmodified opinion,” the highest assurance that a CPA can give a financial statement. In looking at the audit more broadly, Stacey’s presentation also said total revenue increased by $100,000 more than the total expenditures increased. Salaries and benefits take up a consistent portion of those expenditures, 83 percent this year and 81 percent last year. Blake Kirk, a 23-year Holt resident, spoke during the public comment portion of the meeting, and took some of his time to express his optimism in the board. Matt Schmucker is a journalism major with a concentration in photojournalism at Michigan State University. He's covered a range of stories from MSU football to the Larry Nassar scandal as the photo editor for The State News. A new kind of Chipotle restaurant is coming to Delta Township. A ‘Chipotlanes’ restaurant will be coming to the Delta Shopping center, and the drive-through won’t feature an order board or pay window. Drive-through orders will require customers to order and pay through the Chipotle app.